This week, it was hot here in California. According to the weather forecast, it reached up to the mid-90 F… Oh, I couldn’t stand staying under the sun, so I’ve dedicated a lot of my time to do another tutorial here. If you follow the instruction below, it will be around 4″ width. If you want something bigger, you can increase a number of ch in the step 1 and increase the number os sc in the following rows. *** It’s easier to start every row with 1 ch and to end each row with a slip stitch since you will see where you started the row which you are working on. *** I like the seamless surface, so in this tutorial, I take this method. You just have to keep going, but it may be difficult to see where you started the row (especially when you are working on even rows). So, it’s better to use a safety pin to mark the first stitch of each row. Shape “M”, leaving the center and the both ends to low, and making somewhere in the middle (around Row 4) high. Sew a little bit with the yarn to keep the form. Cut the yarn, leaving some length (enough with 10″). Trim the both ends with a yarn needle. Leave the long end yarn. I recommend to tie those two strings together, just in case, before cutting off the short yarn (shown in the picture). Put the oblong (you made at Step 10) through into the center ring. Insert a string of elastic hair band into the center ring and bind it up. Sew the backside of the bow with the yarn needle. At this point, it’s better to hide the joint point of the hair band. Trim the rest of the yarn, and it’s DONE!!! If you are with me till here, thank you so much for your patience!! 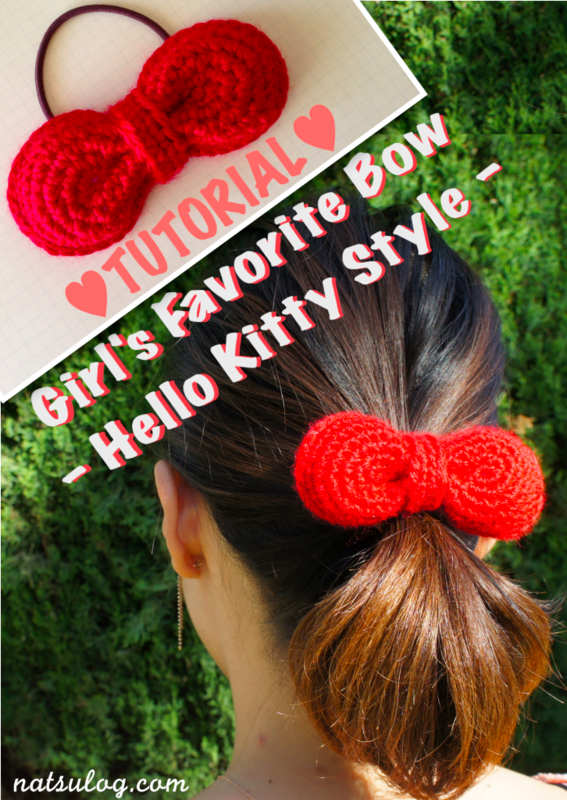 It was challenging for me to explain the flow with lots of photos, but I hope many people will find it easier to understand this tutorial and eventually enjoy making a bow for the summer!! You can also use the bow as a decoration of your bags, clothes or hats!! Please enjoy customizing it as you like! !